L-R (top): The Golden Eagle is the National Symbol of several countries. 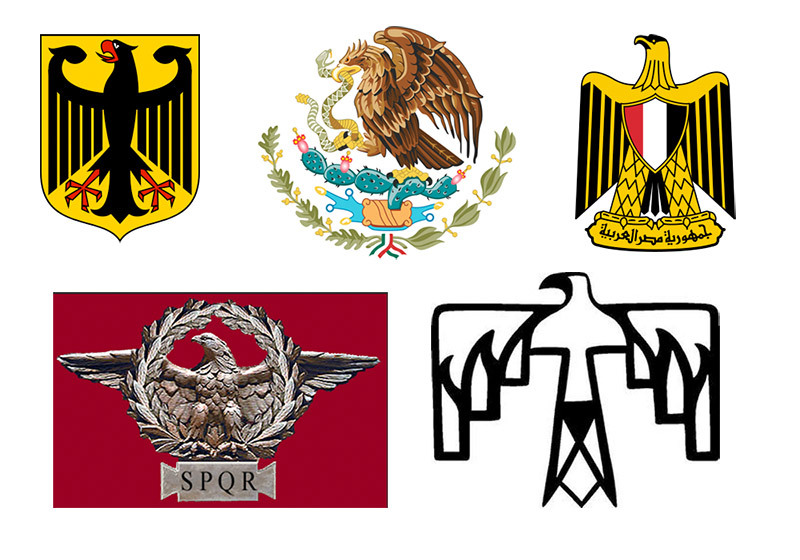 L-R: Symbols of Germany, Mexico, and Egypt. Bottom Row L-R: In ancient Rome, an infantry unit was divided into legions. A standard bearer carried before the legion a staff with a symbol to lead the troops into battle. The most famous was the aquila, or eagle. 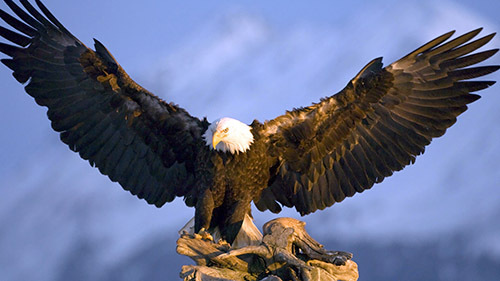 Native Americans considered the eagle to be a messenger of the Gods. Of all the feathers, the Golden Eagle feather was the most coveted. Shown above is a stylized version of the Thunderbird symbol. The Golden Eagle is the most common national symbol in the world: Afghanistan, Mexico, Egypt, Germany, and Scotland have adopted the Golden Eagle as their official symbol. What is the importance of the Golden Eagle in Native American society? Of all the feathers, the Golden Eagle feather was the most coveted and the most significant. If someone had one of these in their headdress, they received a great deal of reverence and respect from other members of the tribe. *In this section, all references to ‘eagle’ refer specifically to the Golden Eagle, as the Bald Eagle is only found in North America. The eagle with its keen eyes symbolized courage, strength and immortality, but is also considered “king of the skies” and messenger of the highest Gods. In ancient Greece, the Aetos Dios was a huge golden eagle – thought to be the companion of Zeus as well as his personal messenger. Aristotle, a famous Greek philosopher & scientist, said that the eagle “flies high in order to see over the greatest area” and that men called it divine because of this. So, in that day and age, humans considered the eagle divine because it flew so high (to the heavens), and because it was so strong and domineering. Ancient Germanic tribes associated the Golden Eagle with Odin. In Norse mythology, Oden was a god of war and death, a sky god, and the god of wisdom and poetry. The eagle, considered to be the greatest of all birds, was held sacred to Odin. In Norse tradition, the eagle’s cry signified the birth of a heroic soul. Also in this tradition, the greatest of eagles sits on top of the World Tree and represents the greatest aspects of the mind and spiritual attainment. In Christian art, St. John is symbolically represented by an eagle, symbolizing the heights to which he rises in the first chapter of his Gospel.